Senate Bill 54, which takes effect in January, has been blasted as “unconscionable” by U.S. Atty. Gen. Jeff Sessions, becoming the focus of a national debate over how far states and cities can go to prevent their officers from enforcing federal immigration laws. Supporters have hailed it as part of a broader effort by majority Democrats in the California Legislature to shield more than 2.3 million immigrants living illegally in the state. Brown took the unusual step of writing a signing message in support of SB 54. 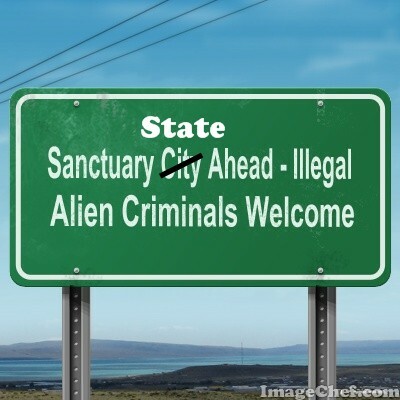 He called the legislation a balanced measure that would allow police and sheriff’s agencies to continue targeting dangerous criminals, while protecting hardworking families without legal residency in the country. That last part seams to be an attempt to head off the retaliation sure to come from the Department Of Justice over a state declaring that they will refuse to enforce federal laws in full, just the ones they like, and that the state will, for the most part, refuse to cooperate with federal officials when it comes to people who are unlawfully present in the United States. Suddenly, Liberals care about the 10th Amendment. If they truly believe this, then this means that states do not need to follow federal guidance and laws on things like transgenders and gay marriage, right? That they do not need to follow the Environmental Protection Act, right? Or laws on ‘climate change’, right? Or a raft of gun laws, right? Choose wisely, Liberals. Who also bleated that the Arizona law on illegal aliens violate federal law. Can’t have it both ways. It’s not a rebuke of Trump: it’s a rebuke of duly passed federal law which Trump is enforcing, law for which the federal government was given the task of dealing with any and all immigration by the Constitution. Regardless, this being Trump, you can expect him to deploy tons of ICE agents to California to pick illegals up in all the places liberals complain about, like at court. Or, he could simply discuss this in a way that will get as many illegals as possible to stream to California, further destroying the infrastructure and tax base. “Instead of federal immigration sending two officers in one car to the jail to pick up and deport the offender, they may instead send a group of officers, dressed in full gear, to the last known address of the offender, to arrest and deport every undocumented individual in that household,” he said. California Dems do not care. They have some resisting to do. And they’ll Blamestorm others when this policy creates more problems for citizens.